The Old Truman Brewery played host to 2019’s London Coffee Festival. The big guns were out in full force over the course of the weekend with espressos, teas, cocktails and flyers being dished out left, right and centre. The festival is a great affair for those with a penchant for flavour profiles. It’s also a great insight into the London coffee scene for those that know nothing about it. Hell, even if you don’t drink coffee, there are plenty of vendors that would make the trip worthwhile. I’ve been going for the last few years, but this was the first time I went with Kavya. Our preference for coffee is quite different - where she’s quite fond of the darker, chocolatey roasts, I usually opt for a fruity espresso. This worked to our favour, as we both tried coffees we wouldn’t necessary gravitate towards. When it comes to trying new coffees, Kavya and I are both suckers for good branding. Having seen a few questionable fonts, we bypassed several stalls before seeing Mok Coffee. The Belgians don’t do things by half-measures (unless you specifically request it, that is), and this Brazilian number provided by the micro roaster was delightful. Two minutes in. Two espressos down. So much for pacing myself. We ventured further down to one of my personal favourites, Berlin-based Five Elephant. 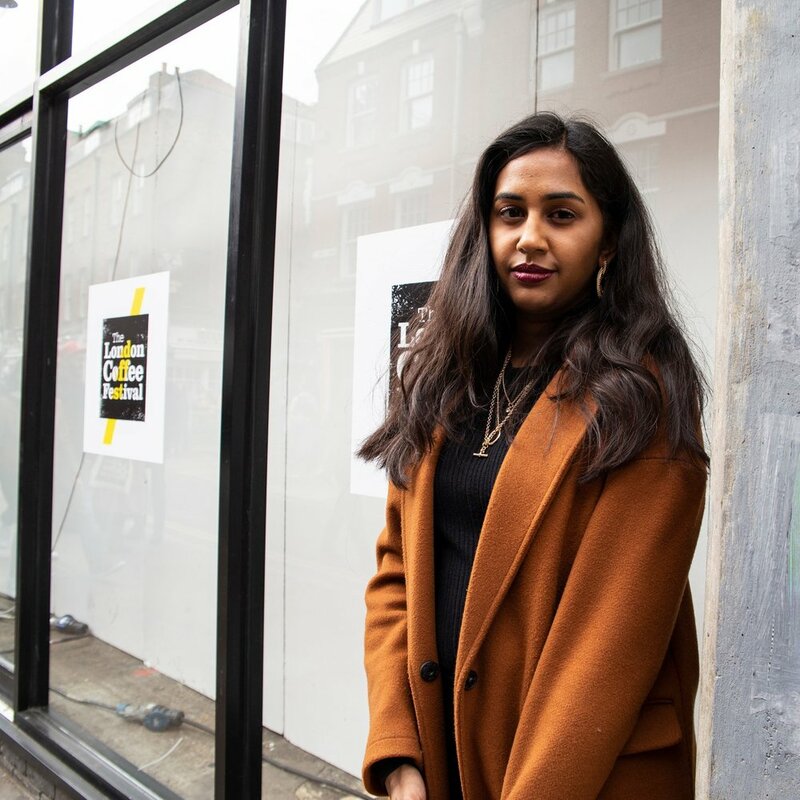 Whilst I was in the queue for an espresso (I also wanted to pick up some beans but of course their filter roasts ran out before 11am), Kavya’s eyes were drawn to a very nicely branded (see what I mean) Woolwich-based roasters, Plot. Her espresso had a lovely sweet and chocolatey finish, whereas the darker Five Elephant roast proved to be quite nutty. All of my favourite London-based coffee roasters/shops were on show, and offered consistency above all else. Origin, Allpress, Ozone, The Gentlemen Baristas, Climpson & Son and the like kept us perky, with brands including Oatly, Minor Figures, Cawston and Lotus providing the much needed breaks in play. After the espresso spree, Kavya and I ventured down to the Coffee Art Project—the one sour point of the day. In and amongst some wonderful pieces, we noticed a crude depiction of Lord Ganesha by Boyish Mind. The piece, called ‘Coffee God’, was apparently ‘playful’ and ‘comical’, and it left us feeling like our religion and culture was nothing more than an anecdote, perfectly okay to be appropriated. And people say everyday racism isn’t a thing. Almost coffee-ed out, no day at the festival is complete without visiting the awesome Girls Who Grind Coffee. Always friendly no matter how long they’ve been pouring and talking, they serve us an incredibly fruity, and punchy, espresso to finish. Dreamy. I wasn’t blown away by any one brand this time ‘round, but I think this was genuinely because the levels continue to elevate. Those that slightly lacked last year performed significantly better, while the masters of the craft continue to lead the way. I’m not really too clued up about the machinery side of things, but if you’re ever looking to explore that avenue, you should hit up the awesome barista, Ari. 2019 is quite an exciting year for the London coffee scene, with more people looking for a better brew and more great coffee shops making it readily available. There’s literally no excuse to get your morning sustenance from McDonald’s, Starbucks etc. Sustainability is proving to be a massive feature in this industry (as well as most others) with work being done around plastic waste, pollution, labour and sourcing. There are an incredible amount of dairy and dietary alternatives, too, making the coffee scene significantly more inclusive and accessible. Long may it continue.